I HAVE STATED THESE KEYS TO BE FRENCH - APOLOGIES TO ALL IF THIS IS NOT THE CASE ?. OLD AND INTERESTING IRON KEY. BOTTOM LINE IF YOU ARE NOT HAPPY. CONDITION EASILY SEEN IN PHOTOS. Get Images that. Make Supersized Seem Small. It would enhance any piece of furniture. German or French. 65.8mm (just over 2½") in length. 20.8mm across the bow. Clean and ready to display - no rust. These Antique Armoire Escutcheons are sturdy but have surface rust, they are of good size,at 37.5cms in length and 3.5 cms in width at widest point. The base metal is silver in colour. DIRECT WITH YOUR DEBIT/CREDIT CARD. You are bidding on a LOVELY set of 5 Vintage/Antique French Cell/Chateau Door Keys - with interesting double holed bows -fantastic!! These lovely keys are made from steel and measure 4" in height. Their double holed tops make them look like skeleton heads - a wonderful detail in these Deco era keys! One in numbered. Not 100% sure on their original use, nor the reason behind the two holes - they are chunky, decorative and displayable! Please study photos to see all the lovely details- they are a lovely lot, and an absolute must have for any collector and those with a lovely house in which to display them!! HAPPY BIDDING! I have lots of keys that I will be listing - happy to combine postage where weight limits allow! SET H.
A HUGE antique French wooden lock with it's original key c1880. In good working condition, a little stiff but works perfectly. The wood has old worm holes but this has been treated as a precaution. Owner bought from Paris. not sure if can be aired to anything but beautiful decorative item. This silvered metal escutcheon is sturdy but has surface rust, which could easily be removed. It is 30.5cms in length. Rare Antique 18th Century French lock with 6 rotating combinations discs. SOLD AS IS & AS PICTURED. SIZE: Body of lock 4cm square (1.5" across) space under loop 2.5cm (0.9"). 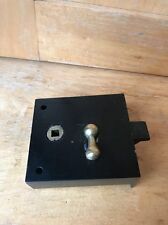 Small lock with key - good working order. CONDITION: see photos. A lovely 1940s heavy French brass lock. It is all in beautiful polished and working condition. to see detailed description,click READ MORE.